Elite Rapidstrike CS-18 goes up for Amazon Pre-Order, Could this be The Big 9/9/2013 Release? What ticks me off a bit is the release date for the blaster. September 1st, which is still Fall 2013, is when Amazon starts to ship out the blaster. I was hoping to somehow get this a bit earlier in anticipation for my Summer’s Humans vs. Zombies game. There’s a small chance I’ll get it in time for the game anyways though. Now Hasbro/Nerf haven’t marketed any special, big, 9/9 blaster for release this year. That probably has something to do with all the product their releasing this year. From the Centurion, Rapidstrike, Revonix, to the Rebelle line, Vortex repaints, and maybe coming this year Zombiestrike line, it might not be the smartest thing to market one particular line or blaster for a special date when your other lines need some marketing attention as well. For the past 4 years (starting back in 2009), Nerf has released special, big blasters (or in one year, the Vortex line) that have either changed the game, or been good products in themselves. Leaked Rapidstrike photos and videos have been well received by the NIC and HvZ community. With us somewhat conditioned to be on the look out for a big release in September each year, could they be using that to their advantage to help market and sell the Rapidstrike? Nerf again has a lot of scheduled Fall products coming out, so it makes sense that their trying to space out product releases. The Mega Centurion is scheduled on Amazon, Target, Walmart, and Kmart to come out August 1. All Nerf fans can do at the moment is keep their eyes open to the net for scheduled release dates, pre-order if they want, and count the days until product comes out. At the very least, I can say that the Rapidstrike is going to be a GREAT blaster for both modders and non-modders alike. The UK release date is 8/1. 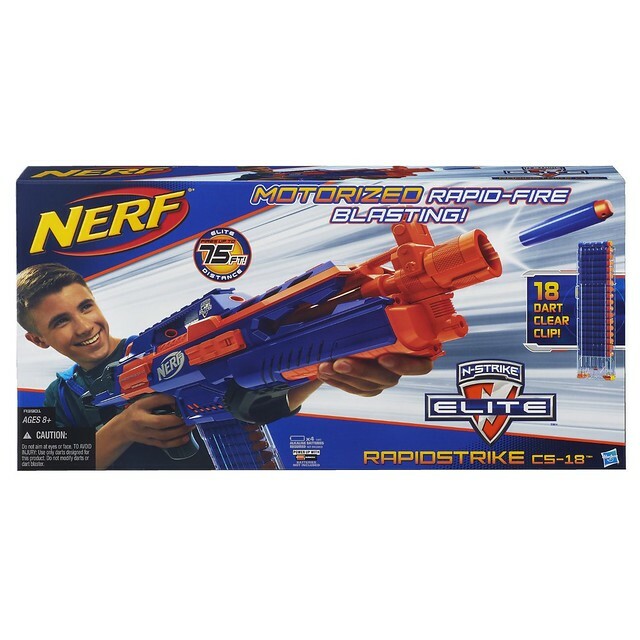 We will probably be able to score rapidstrikes early from amazon.uk or another UK website. Some people went that route with the stockade. Some people I’m sure already have exported them from the UK. I know this site offers international shipping. But their sold out at the moment. They also offer international shipping, so I tried ringing it up there. After conversion costs and shipping, it’s about $75 USD. I can’t really justify myself to spend that much money on this, I would rather wait until it actually comes out and get it for around $40 USD. I tend to agree with you if we’re only talking about waiting a month. I can wait that long. I have plenty of things to spend my money on right now. Any idea how somebody gets into this amazon vine deal? You can view more info on the Amazon Vine program here. First of all how much is it? I’ll probably wait for the in-store release myself but this could be interesting. Any way according to a unknown person the flagships initals are MO, MA and MJ. I got this info from here http://urbantaggers.blogspot.com/2013/05/n-strike-elite-rapidstrike-official.html it’s in the comments towards the bottom. I hope so, because I REALLY want this blaster. Picked up one at a TRU in Halifax and I’m disappointed. First off the safety catches are spotty and it doesn’t always want to rev up correctly, and frequently just stops dead mid-clip. Second, I think Hasbro doesn’t want us to get into it because I’ve taken out all the visible screws, but the shell is stuck closed around where the dart pusher is located inside. I think it might have been glued shut.